AR-15 Gas Block .750 Low Profile. black anodized, fits .750 Barrels. AR-15 Gas Block .750 Round Profile. The 2" Low Profile Gas Block is made to cover the area under the fixed sight gas block and hides taper pin holes. Machined from 4140 pre-hardened steel finished with MIL-STD Manganese Phosphate. Gas tube roll pin not included. 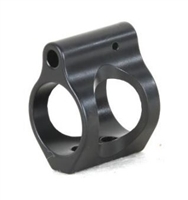 The Troy 0.750 Low-Profile Gas Block is made specifically for rifle barrels that have a 0.750 gas block seat. The low-profile design allows for clearance of most aftermarket rails that require a smaller gas block. Machined from 4140 pre-hardened steel finished with MIL-STD Manganese Phosphate. The Troy low profile gas block fits tightly to the barrel using two set screws. Gas tube roll pin not included.